The Observer Food Awards 2011 Maltby Street traders are to start their phased move from the Bermondsy railway arches on 31 March 2012. Moving just a few minutes walk further up the railway line out of London Bridge will place them handily just 5 minutes from Bermondsey Underground station. The traders mentioned in my 'Bermondsey Trail' will be occupying arches and units centred around the disused Spa Road London to Greenwich railway terminus. Not everyone will be moving in phase 1 on 31 March but as of that date you'll find your favourite traders at the following. Dates for the move of those traders unchanged by the phase 1 move are to be advised later. This will be a more settled home for the award winning traders who have worked so hard to build their businesses and serve us with some of the best produce in London. You can pick up a copy of the flyer photographed above from The Ham & Cheese Company at 1 Ropewalk on 17 or 24 March. I expect http://www.maltbystreet.com/ will be updated soon. 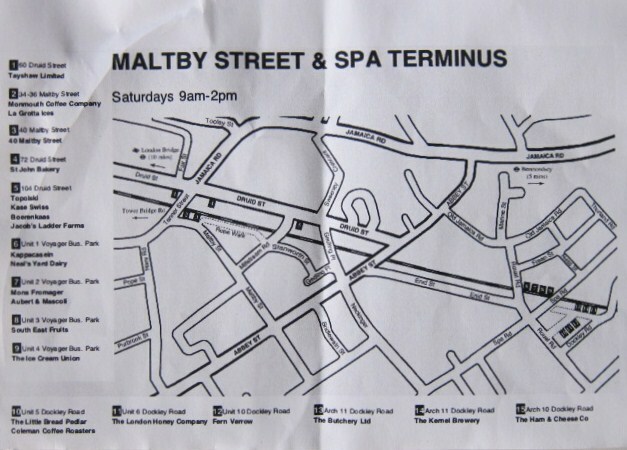 If you already know 'Maltby Street', I hope this information helps you find your favourite traders. If you haven't discovered it yet, you'll find some of the best produce in London here.